Early this year I found a great shopping destination in Europe. I was convinced that my shopping times are over here in Prague, but then I discovered my new fave shopping destination Dresden! Hurray! Thursday evening a friend texted me about her 2 days trip to Dresden, Germany. Just a few hours later we were on the train heading to Germany. My very first trip in 2016, was unexpected shopping experience & great city break!. So if you wish to spend a weekend in one of the historical European cities & do some shopping, you should definitely visit Dresden. For those of you from Czech republic, I highly recommend Dresden for a one day shopping trip. Significant discounts & sale in all shops makes your trip worthwhile. Shopping heaven just 2.5 hours away from Prague… wooohooo! A fun time on the train, destination Dresden S-Bahn. Train is a quick & worry-free way (about 2.5 hours) how to get from Prague to Dresden with a glass of wine in your hand :) That’s one of the best things about Europe – travelling! Everything is just so close. 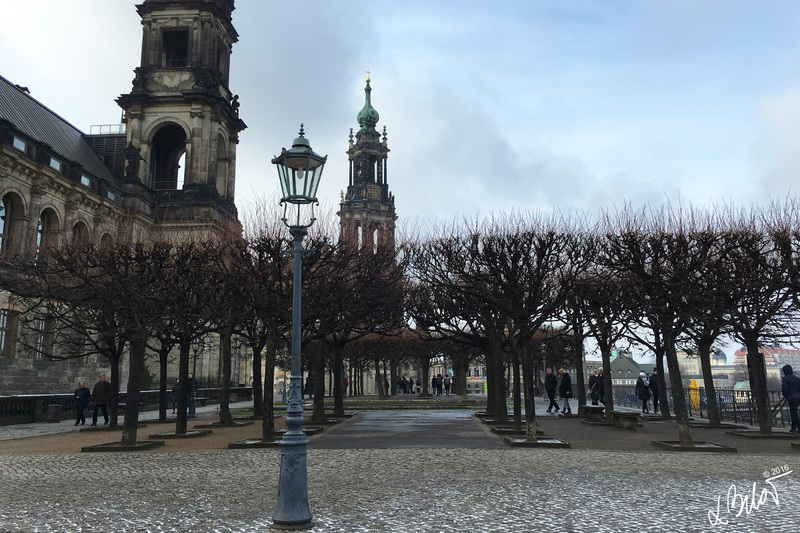 Dresden welcomed us with a sunny but freezing weather (Mid January)! But thanks to the ubiquitous Starbucks & Slovakian slivovitz (slivka) we survived! Drinking regime is VERY important! Have visited Pull & Bear stores so many times, in different cities around the world, but usually I left empty-handed, due to high prices. But with a great 80% deals I felt like a child in the chocolate factory :D Got an amazing textured coat in mustard colour. A very important tradition in Saxony is coffee & cake. In fact Saxons were the first in Germany to add cake to their coffee drinking – a tradition that has spread throughout Germany & has become part of its culture. So if you will visit one day DO try cakes, pastries & other baked goods – such as these amazing breads – baked with bacon, cheese, mushrooms & other yummy ingredients. Germany is known as a beer country, the most well-known beers of the region are “Radeberger” & “Wernesgrüner.” Im not a huge beer drinker, so I enjoyed my beloved Jägermeister (German digestif made with 59 herbs & spices). The area around the train (S-Bahn) station is surrounded by shopping malls. Quite amazing I would say, Like a city of shopping, we just walked from one store to another. Clothes, shoes, restaurants, groceries, cinema, bars. Days can be spend there haha. Dresden is a capital of the eastern German state of Saxony. Is known by the art museums & classic architecture of its reconstructed old town. Dresden was & still is a cultural, educational, political & economic centre of Germany even whole Europe. The city was almost destroyed during World War II, but rebuild back to its glory, this German city’s Baroque core shines again. Remarkable job. The Fürstenzug (English: Procession of Princes) – a large mural of a mounted procession of the rulers of Saxony. It was originally painted between 1871 and 1876 to celebrate the 800th anniversary of the Wettin Dynasty, Saxony’s ruling family. The mural displays the ancestral portraits of the 35 margraves, electors, dukes and kings of the House of Wettin between 1127 and 1904. In order to make the work weatherproof, it was replaced with approximately 23,000 Meissen porcelain tiles between 1904 and 1907. The mural is 102 metres (335 ft) long & it is known as the largest porcelain artwork in the world. Small souvenirs from our walk in the historical part of the city. Was so cold, city was almost empty… I deeply respect souvenir’s sellers, how they can stand out there all day. Dresden must be amazing during the summer months. Beautiful sceneries & historical soul of the city has a very calming effects. Walking around the city was a fantastic relax & break from the busy shopping mall. But mid January in Dresden is a freezing time, so dress well guys! The winter market was definitely a life saver, we had a few glasses of mulled wine to keep us worm. On the way back with my fave rose I discovered in a local groceries market! What not to love about Dresden? Amazing food, excellent shopping & my fave rose! I’m going to a euro trip in april, and I almost put this city in my list. Now seeing these photos I became very regretted. Are you planning also visit Prague?